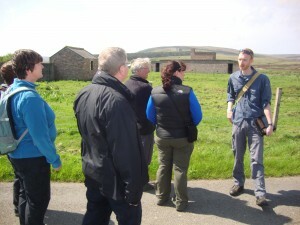 In October 2013, the Island of Hoy Development Trust (IoHDT) gained funding from ScotGrad Graduate Placement Scheme, Orkney Islands Council’s Community Development Fund and the Heritage Lottery Fund’s Sharing Heritage Grant Scheme to undertake a 12 month study of the Island of Hoy’s rich World War Two (WWII) archaeological heritage. The project was undertaken at a time of heightened global interest in wartime heritage fuelled by the 70th anniversary of WWII when many of the derelict standing remains of WWII appear to be reaching a critical ‘point of no return’ in their rate of decay. It built partly upon initiatives and interest for Hoy’s wartime heritage initially stimulated by the Scapa Flow Landscape Partnership Scheme of 2009-2012. Planned redevelopment work at the Scapa Flow Visitor Centre & Museum also highlighted the value of an island-wide wartime heritage evaluation project for cooperating with and mutually supporting larger initiatives interpreting Hoy’s rich wartime heritage. 3. 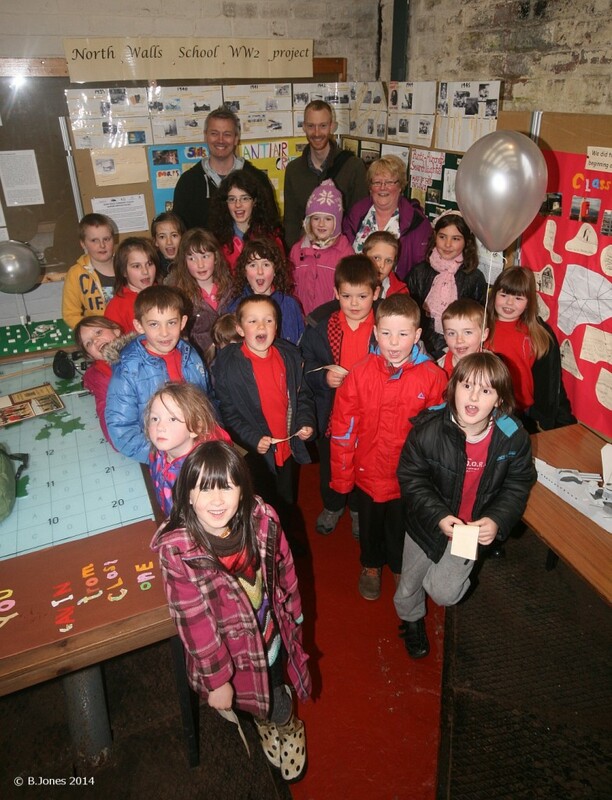 To establish whether wartime heritage could be utilised as an all-age educational strategy. 8 A series of guided walks to encourage and evaluate adult engagement with wartime heritage through directed visits to WWII sites. Throughout the duration of core activities 3-8, data was collected by way of participant questionnaires, informal conversations and participant observation in order to assess how different groups engaged with Hoy’s wartime heritage. Questioning was also directed towards future engagement and heritage resource management. A study of relevant historical archive documents, aerial photographs and published literature was undertaken to provide a historical framework summarising Hoy’s significant involvement in World War Two (WWII). This work revealed connections to some of the major global narratives of WWII such as the Kreigsmarine ‘Full Engagement’ campaign of 1939-1940, the Allied and Axis invasions of Norway, the Battle of Britain, the Arctic Convoys, Operation Overlord, Operation Market Garden and the V1 attacks on London as well as numerous other Royal Naval Home Fleet operations. Find out more about the Hoy’s fascinating connections to World War II events by following the links or visiting Hoy & Walls in WWII. Archive research also informed archaeological fieldwork, outreach & educational activities through the provision of valuable historical material for creating resources for all of the other project engagement activities. Hard copies of aerial photographs (obtained from the National Collection of Aerial Photography) were organised into a comprehensive photographic archive, forming a locally accessible resource for the community of Hoy and Walls. The collection forms a sustainable resource that allows islanders and visitors alike to continue to explore Hoy’s wartime past through aerial imagery held at the IoHDT Office in Longhope. The Geographical Information Systems (GIS) WWII archaeological site database combines geo-referenced wartime maps and aerial photographs with Ordnance Survey map data and archaeological site survey data. Together they form a user-friendly interactive computer resource for the community and other interested parties to conduct their own research into Hoy’s extensive WWII archaeology, making the island of Hoy’s wartime heritage more accessible and engaging for local residents and visitors. The database also forms a valuable asset for a range of local and other stakeholders for informing future site management and the development of heritage/planning interpretation initiatives. If you would like to view the photographic collection or explore the GIS database then please contact IoHDT to arrange a suitable time. A program of community supported archaeological survey located and recorded an incredible 415 previously unknown WWII archaeological sites from Rackwick in the north to west Cantick in the south east (navigate your way around wartime Hoy virtually using our Site Explorer). Many of the sites recorded were found to be incredibly well preserved and rank highly amongst the best examples of WWII military offensive, defensive, supply and support structures in the UK. Three concentrations of military sites around Wee Fea, Lyness and Rinnigill are considered of such high historic value, that they merit consideration for non-statutory protection as conservation areas. Archaeological fieldwork proved a highly effective educational device encouraging direct engagement with wartime heritage through active participation in identifying and recording sites. Participant feedback also revealed that archaeological survey was a good community enhancing activity as it brought individuals together who would otherwise not have met to carry out group-based tasks. A wartime heritage project with North Walls Community School was conducted to evaluate the potential use of WWII archaeological sites as an effective educational resource. The project proved a resounding success, with high levels of engagement and information retention observed in all of the primary aged pupils who participated. A wartime heritage project – utilising archaeological site investigation as the principal learning access point – was found to be perfectly suited for the Scottish Curriculum for Excellence (CfE). The North Walls Community School project successfully covered 38 experiences and outcomes across 7 curriculum areas, providing opportunities for pupil development in all four capacities of CfE. 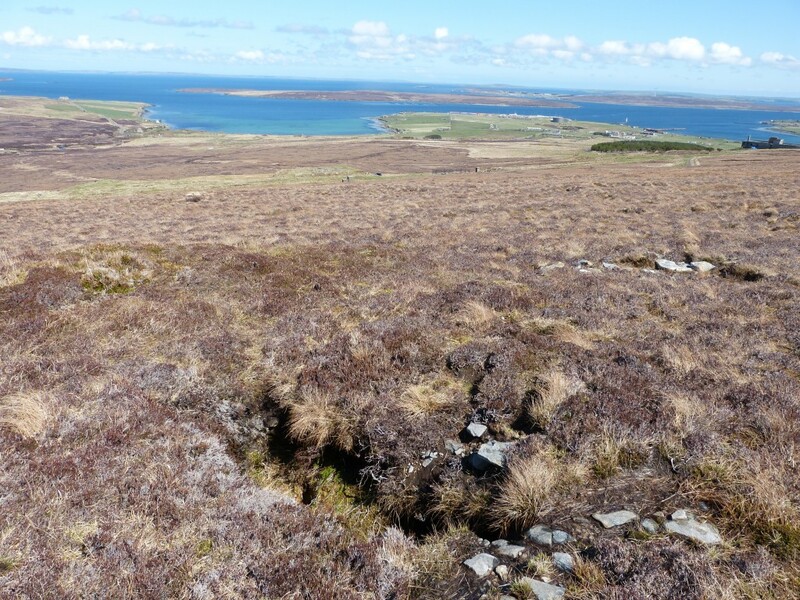 The educational potential of Hoy’s wartime heritage was further demonstrated through the use of archaeological sites in an outdoor education orienteering trail. The geocache trail was delivered in cooperation with OIC Outdoor Education and consisted of seven weatherproof plastic ammunition-style boxes located at wartime archaeological sites on Wee Fea. 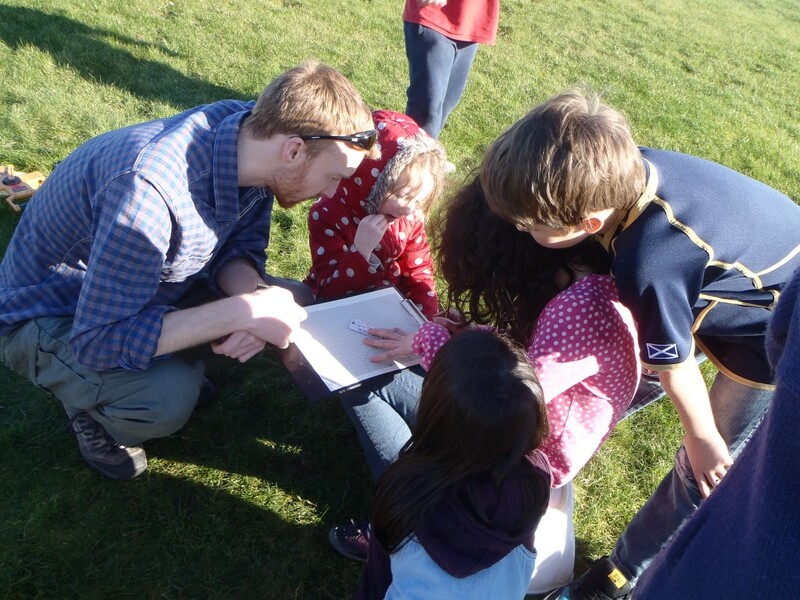 Although the trail was not fully tested during the project, a preliminary trial with Primary 6 pupils from Papdale Primary School indicated that archaeological sites could be used effectively to educate schoolchildren about WWII in an active and engaging way. Drop-in/open door sessions were run at the Hoy Kirk, the Royal Hotel in Longhope and the IoHDT Office in Longhope, providing visitors and island residents with opportunities to interact with wartime heritage on an informal level. 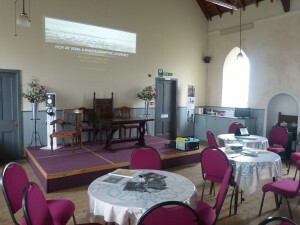 The event provided a relaxed venue where archive materials could be consulted, presentations viewed, artefacts brought for identification or stories and information shared. Results from participant feedback and attendance figures revealed a greater response to this event in the parish of Hoy than in South Walls. The figures also illustrated a preference in North & South Walls to engage more passively through attending an evening talk rather than more actively at a drop-in. However, when archive materials were made available for consultation at an evening talk they were well received. Questionnaire returns also indicated a greater interest by visitors and islanders to engage through drop-in sessions in the future. The evening talks programme followed a regular monthly pattern and were delivered at The Gable End Theatre, a popular and well established venue for evening entertainment on Hoy. Each talk followed a theme and endeavoured to share some of the information that had been researched during the desk-based consultation of archive sources. The talks received the second highest attendance of the events delivered during the project and were by far the most popular method for island residents to engage with wartime heritage. Although few visitors attended the talks, participant questionnaires indicated an interest by visitors in engaging through such events in the future. 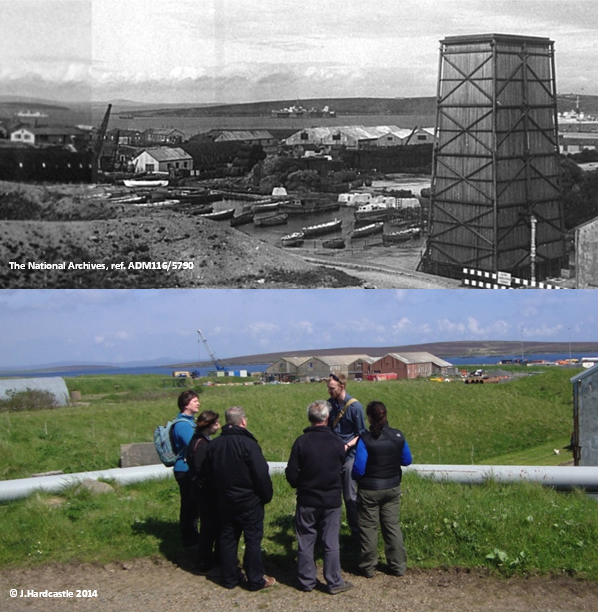 An assessment of the wartime archaeological resource as an attraction for tourists (and as a possible additional source of island revenue) was carried out through the evaluation of visitor participation in all of the events and activities delivered, but primarily through involvement in guided walks around the WWII Naval base at Lyness. The walk followed a 2 mile circular route that allowed the story of the naval base, the personnel and their role in WWII – told through archive images and the extant archaeological remains that are found in abundance around Lyness today. 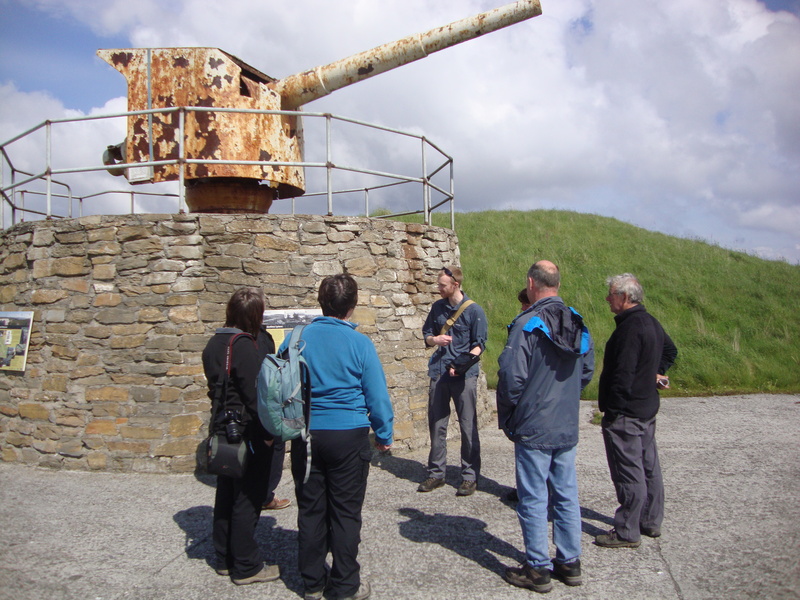 Over the 26 weeks that the Lyness guided walks were run, a total of 189 people engaged with the archaeological legacy of the WWII naval base. Feedback and attendance data demonstrated that with sufficient publicity and investment, visually stimulating active forms of engagement, such as guided walks and trails, would be extremely popular with tourists and could be developed in the future to increase visitor numbers to the island. Participant questionnaires also highlighted that the guided walks attracted a new type of tourist to Hoy that otherwise may not have visited the island. This is a particularly important dataset, as it demonstrates the potential of wartime heritage to draw a new tourism market to Hoy and Orkney. In the majority of cases the stops were positioned so as to tie in with the location from which an archive photograph had been taken, allowing the group to relate what they could see with what a site or location looked like during WWII. This example is Point of Interest 17 below the WWII archive image shown to visitors at this location to bring the scene to life. Wartime heritage was found to be most effective as a community enhancing resource when employed as a means of bringing people together, creating opportunities for island residents to meet, interact and learn together. Activities such as archaeological survey, evenings talks and drop-in sessions were particularly effective in this respect. The project also demonstrated that archaeological fieldwork on and guided walks around wartime sites, as well as evening talks or drop-in sessions about wartime heritage, served a particularly effective adult educational purpose with all participants learning something from their involvement in these activities. These results highlight that a variety of integrated approaches can be implemented to better use the WWII material legacy on Hoy as an adult educational resource. Participant questionnaires revealed that, although involvement in other activities such as archaeological fieldwork and evening talks was low during the project, there was a general desire to engage in these activities in the future. A new area of interest for ‘in the passing’ engagement was also identified which could be build up into a tourist attraction for the future. The data gathered indicates that a great deal of interest in wartime heritage exists amongst tourists visiting Orkney and it is anticipated that further development of attractions and interpretive devices would nurture this interest and encourage greater numbers of tourists to visit Hoy for longer periods of time. As part of the participant questionnaires, visitors and islanders were asked to state from a list of options who they felt were the most appropriate organisation to manage Hoy’s wartime heritage in the future. A National Heritage Protection Agency such as Historic Scotland or a Hoy-based trust or charity were perceived to be the most appropriate long-term managers of Hoy’s wartime heritage, with the local council surprisingly being the third choice for visitors and the lowest choice for island residents. The first choice of National Heritage Protection Agency could be attributed to Historic Scotland’s perceived excellent reputation for safeguarding Scotland’s heritage, but may also indicate an acknowledgment by participants that Hoy’s wartime heritage is of National importance, warranting a greater level of recognition and protection than it is currently afforded. The equally high response for a Hoy-based Trust or charity to manage the wartime resource could be viewed as a strong display of support for the work of IoHDT and how positively the Legacies of Conflict project has been received. A general lack of confidence in OIC as a manager of wartime heritage was detected in feedback from island residents, which appears to stem from a lasting memory of demolition and clearance of wartime sites in the past. It is clear that the ideal way forward to deliver real success over such a wide range of complex deliverables would be some form of strategic partnership between these three key stakeholders. 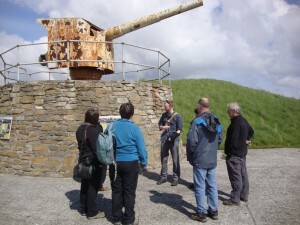 The evaluation of community, islander and visitor engagement during the Legacies of Conflict Project has revealed that Hoy’s wartime heritage (and its extensive material legacy) can provide a valuable all-age educational resource, community enhancing asset and means of attracting greater numbers of tourists to Hoy. Four core output areas (Figure 1) that underpin future development have been identified which seek to build on the demonstrated values of Hoy’s wartime heritage. Archaeological Resource Management is a key consideration of any future development work as it concerns the long term care, maintenance and understanding of Hoy’s wartime heritage asset. Without these active steps to identify, document, preserve and interpret Hoy’s well-preserved archaeological sites, future use of wartime heritage for education, community enhancement and tourism will not be as effective or sustainable. Education clearly has an important role to play for both the preservation and interpretation of wartime heritage into the future. WWII sites and stories have proven to be powerful tools for teaching younger generations about past conflict. The development of resources to integrate more fully with the school curriculum and engage with children in less formal learning environments are an important development output. Community Enhancement has been shown to be a positive outcome from events and activities delivered during the Legacies of Conflict project. The creation of local jobs and continuing to provide opportunities for island residents to meet, learn and engage with each other and their island’s past through passive and active events programme are socially valuable outcomes. Tourism can have a significant soci-economic impact on a small community. The four subcategories within this core area are intended to develop attractions to encourage more visitors to Hoy, providing additional revenue and stimulating economic growth on the island. Interpretation of the wartime archaeological landscape to a wider audience is also a key educational output, teaching more people about the impact of WWII on Hoy and telling the incredible story of one island’s important role in a global struggle. 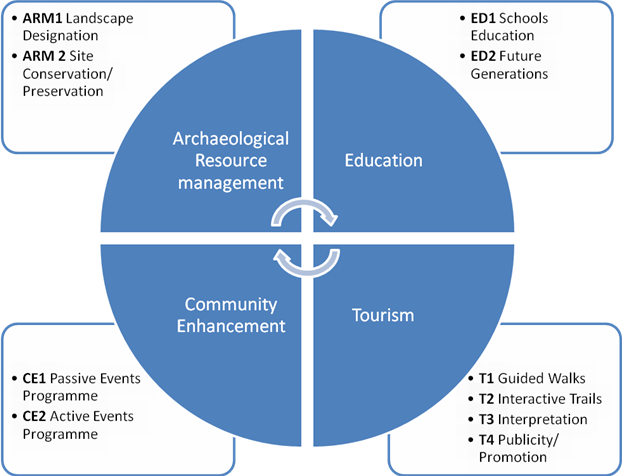 These core outcomes are intended to provide direction for the delivery of sustainable tourism and community heritage initiatives, with each development recommendation directed towards achieving these capacities. A phased development plan, requiring increasing levels of investment, is presented below. The timescale corresponds with the 80th anniversary milestones of WWII (2019 – 2025), which provide an excellent context for heightened global interest in WWII history for the public launch of events, activities and interpretive programmes. Orkney wide publicity of events & activities. The production of a marketing plan offering guidance on how best to publicise wartime heritage to attract visitors. Expansion and full delivery of a marketing and advertising plan. Five years of war has left a lasting legacy on a small island in Orkney. The landscape continues to bear witness to those tumultuous times, but it doesn’t do so in silence. This project has demonstrated that overgrown earthworks, crumbling concrete and imported brick (not traditionally viewed as heritage monuments) continue to speak to the present population of Hoy and those who visit the island’s shores. This development document has endeavoured to summarise the results of a very successful year of community and visitor engagement with WWII heritage and hopefully serves to illustrate how vocal the archaeological remains of WWII continue to be. Collaboration and cooperation with departments of Orkney Island’s Council (OIC) has been instrumental to the successful delivery of this project and the recommendations presented are intended to reflect that positive working relationship and allow a wartime heritage development plan to be produced that is both collaborative and mutually beneficial to OIC the residents of Hoy and visitors to the island. It is hoped that this document and the growth of interest in Hoy’s wartime heritage that has come from the project will serve as a solid basis for the residents (through the Island of Hoy Development Trust) to create a plan for the future of Hoy’s rich wartime legacy. Through continued momentum, financial investment and strategic development, Hoy’s exceptional wartime remains can be safeguarded for future generations of islanders, interpreted more clearly to a greater number of visitors, utilised more effectively as a community enhancing, educational and socio-economic asset and ultimately bear a more fitting and longer lasting tribute to those who gave their lives in defence of these islands shores during WWII.